Paper size is something we don’t give that much thought to, most of the time at least. If you have a printer (and you’re not in the US), chances are it is an A4 model. If not, it’ll almost certainly be an A3 inkjet, perhaps even one that can print onto oversized A3 – probably SRA3. But have you ever stopped to wonder where this ‘A’ paper size thing comes from? 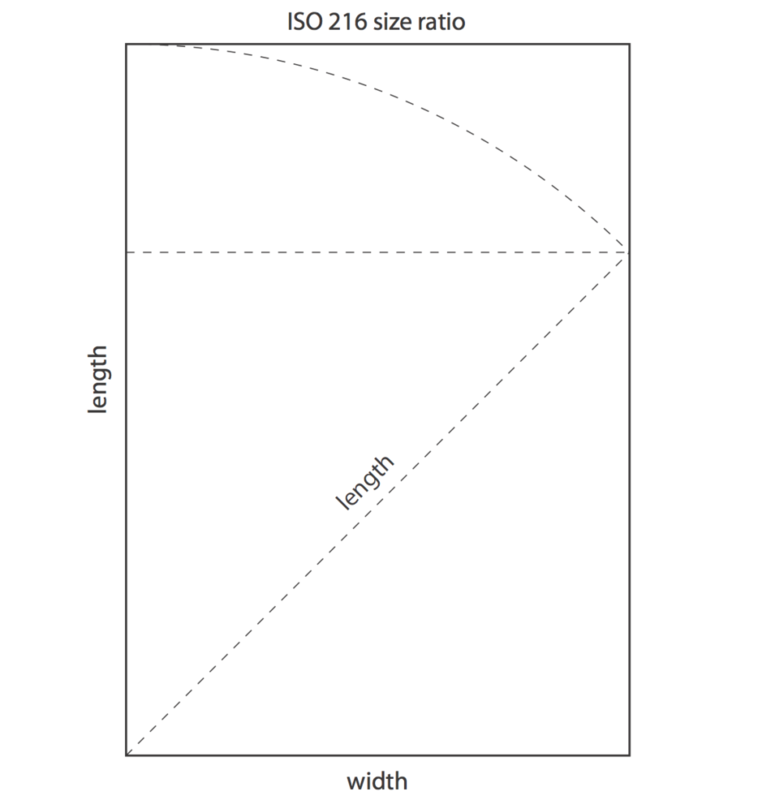 It is all part of ISO 216, the International Standards Organisation system of paper sizes. The ISO system was defined in 1975, but it is based on a widely-adopted 1922 German DIN standard. (In fact, its roots in fact go right back to paper formats developed in 1798 during the French Revolution, which themselves came from the writings of a German physicist in 1786). This is used almost everywhere in the world. Only our American and Canadian cousins have held back, sticking with the less logical Letter and Ledger sizes and the ANSI paper sizes spun from this just 15 years ago. The ISO system is based on some fascinating (okay, to me at least) mathematical logic. It starts with the largest of the A paper sizes, A0. This has an area of precisely one square metre, and the long size of the paper is the short size multiplied by the square root of two – or 1.4142135 etc. Those of us who aren’t complete number freaks can be forgiven for pausing there and feeling a little blank. Another way to describe it is this: the long side is the length of diagonal line across a square made from the shorter side. No help? What makes this particularly clever is that when you take the A0 sheet of paper and cut it in half you end up with two A1 sheets. They are proportionately exactly the same, just smaller; half the area to be precise. Keep cutting the sheets in half and you step down the A paper size list; A2 to A3, A3 to A4, and so on. This helps reduce paper waste in commercial printing and simplifies scaled reproduction – i.e. photocopying up or down sizes. Put like this it seems so obvious and sensible that it is strange to think this has only really been standardised in most of the world during the mid and late-20th century. Britain settled on this in 1959, long after Iran, Italy, Norway, and dozens more. As well as controlling production waste and simplifying stock control it also helps in calculating weight. 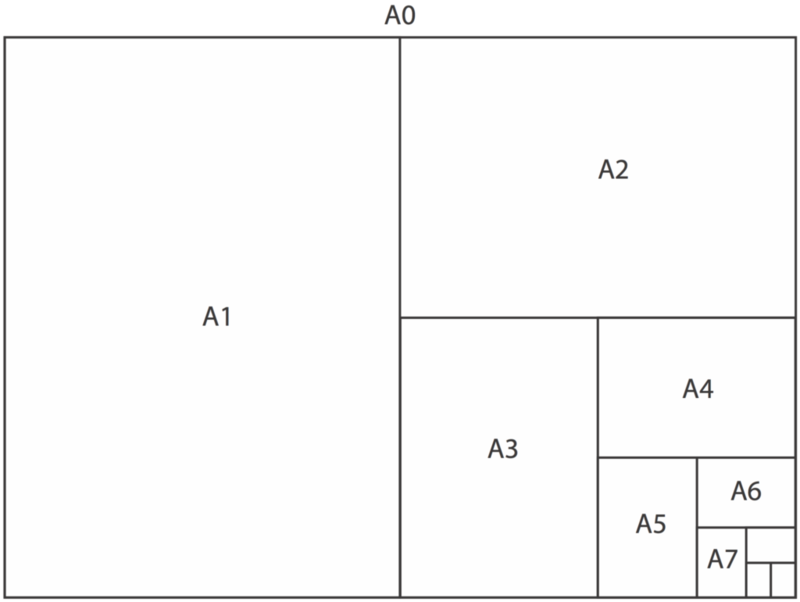 For example, a sheet of A4 paper is a sixteenth of the area of A0. If a paper’s weight is 80g/sm (80 grammes per square meter, the area of A0) then the A4 sheet is 5g (g/sm divided by 16). Use this size stock to produce a 200-page magazine and the result will weigh 1kg, plus negligible allowances for cover stock and binding. Cut this to 70g/sm and 160 pages and you’ll save almost a third on weight. If you’ll be shipping or posting large quantities this can be important. America’s Letter size, shorter and wider than A4, has a rather less precise foundation; it is said to be based on a quarter of the maximum reach of a papermaker vatman’s arms. Even stranger, it existed as two slightly different sizes until the 1980s when Ronald Reagan stepped in and picked one. Okay, the weight thing can be worked out in a roughly similar way, but it is nowhere near as elegant or easy. US paper weight is generally based on 500 sheets of 17x22in stock, typically then cut in four to make Letter-sized reams. Divide the paper weight by 2000 (1/500th of a quarter of the given weight) to get the actual per-sheet weight, then extrapolate up from there for finished document weights. Not fun at all when working in pounds and ounces! Okay, enough history and comparison, let’s look at some practicalities. Understanding how paper sizes relate can be very useful when talking to printers or planning out some work. The A sizes are finished, trimmed ones. For paper to go through commercial printing presses there has to be room for mechanical gripping, and full-bleed artwork needs to print onto larger areas and be trimmed down afterwards. Put an R prefix onto the paper size name for sizes big enough for trimming. SR sizes (SRA3, etc.) are big enough for full bleed and grip as well. 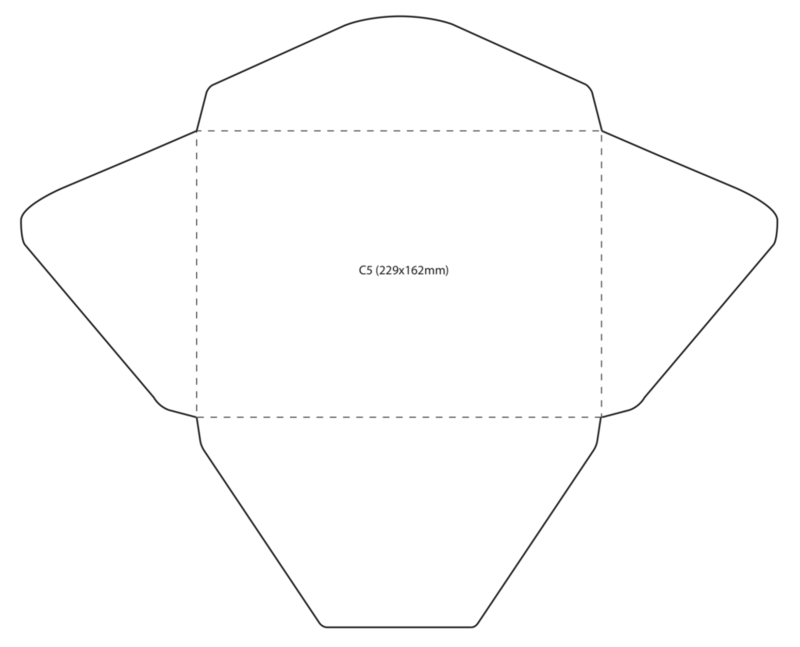 There are two other ISO paper standards; B and C. The B-series sizes are the ‘geometric mean’ (sorry, maths again) of the nearest A-size sheets; B1 paper sits between A1 and A0 sizes. B0’s width is precisely 1 metre, so the smaller sizes are clean fractions of a metre. You’re not likely to see B-size paper in offices, but it is common in the printing industry where multiple pages are ganged up and printed together before folding and trimming. A B2 sheet-fed printer is typically used for printing eight-page sections (A4 four-up, two-sided) for magazines and brochures. B1 allows 16-page sections (A4 eight-up, two-sided). Printing in sections is what dictates the length production schedules for different magazine sections, and hence the length of the different parts. Flick through the first magazine you find. It isn’t always obvious (or it could get boring), and adverts also cloud things, but magazine structures are based on the number of pages in each print production section. For example, news is normally the last to be written, laid out and printed, so that’s normally done in it’s own section. 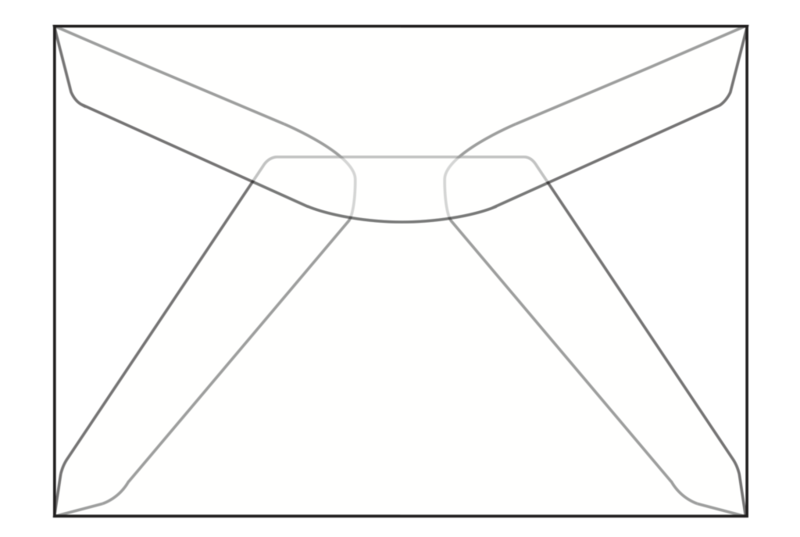 The B series is also used for envelopes, posters are also often produced in B formats, and B5 (larger than A5, smaller than A4) is not an unusual finished size for books. Actually, in Sweden there are even more series; they went overboard with the paper size idea and created further ones labelled D, E, F and G as well. Fortunately, most aren’t common even in Sweden and they’re unknown elsewhere. Japan’s B-series is slightly oversized compared to the rest of the world, but otherwise it follows the full ISO paper standards. The ISO paper sizes work together with impressive logic. True, the names aren’t as interesting as the traditional English sizes that were ousted. From Albert to Emperor, via Foolscap, Duchess, Elephant and others; not as practical but highly evocative. See bit.ly/oldpapersizes for a lengthy list. You’re free to choose non-standard sizes for your design projects if you prefer, but remember to think about how your choice fits into the paper size your printer uses. If it doesn’t work out well you’ll create a lot of waste and put your print costs up. The next time you put a sheaf of A4 paper in your printer take a moment to remember how this size works and where it came from.